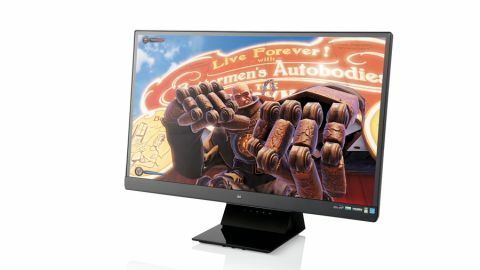 A basic IPS monitor for the budget market. Can it compete against fully-featured TN screens? The AOC i2757Fm and this Viewsonic VX2770Smh-LED are two peas in a pod. Both are budget-oriented 27-inch models with 1,920 x 1,080 full-HD resolutions and sporting IPS panels. Indeed, they both have the same slim-going-on-non-existent bezel design. If you were feeling particularly cynical, you might guess that they were based on some kind of shared monitor kit knocked up by some faceless mass-manufacturer, to which various monitor brands add a few distinguishing flourishes. Whether or not there's an element of truth in that, the suspicious whiff of familiarity fades as you get to know this pair of screens. On the downside, the shiny Viewsonic looks a bit dowdy next to the spangly brushed-metal sleekness of the AOC. Somehow the pseudo-no-bezel design doesn't work quite as well when paired with black plastic. However, the good news is that this monitor doesn't suffer from the AOC's craptastic default settings. Thankfully, it looks great right of the box. As you'd expect from an IPS screen, the viewing angles are very good. OK, Samsung's PLS panel has shown even better can be achieved regarding horizontal angles. But you're still getting a step up from TN tech. That quality is also evident in our test images and scales. Both white and black scales look impressive, and gradients are rendered nearly flawlessly. It's also a little brighter and more vibrant than the supposedly similar AOC, and it quickly becomes apparent that you're looking at a display with far fewer inherent flaws. Is that down to panel quality or image processing? There's a good chance they use precisely the same panel, and thus it's odds on the latter. Whatever, if you care about image quality this Viewsonic is the obvious choice. Especially when you factor the modest cost saving. If styling and features are more of a factor, it's a much tougher choice. As well as being more of a looker, AOC gives you frills like MHL, a connector that allows you to pump the image of an Android smartphone onto the big screen. The Viewsonic also scores a fail with its stand and base design. For starters, the OSD controls are located on the base in a fashion apparently designed to ensure you've no chance of seeing them from a normal seating position. Dumb. As for the stand, it includes a tilt hinge that is remarkably unenthusiastic when it comes to maintaining your desired position. Some re-engineering needs to be done to make the masses balance better. It's all just a little bit off kilter in its current configuration. Overall, the Viewsonic VX2770Smh-LED makes for a pretty nice 1080p 27-inch panel. It's a good choice for movie buffs and for gamers who want a big screen and either can't stretch to one of the high-res screens or lack a graphics card capable of driving really big resolutions. However, it's not massively better than the best TN panels currently available, so it all comes down to whether clearly superior viewing angles and slightly better colours are worth a small price premium.